I’m quite delayed in posting this but I did want to take the time to post one last entry from my trip to Asia! This was my second time in Cambodia, but I got to spend much more time there this time and thus was able to do much more food research ahead of time and eat at some lovely places. 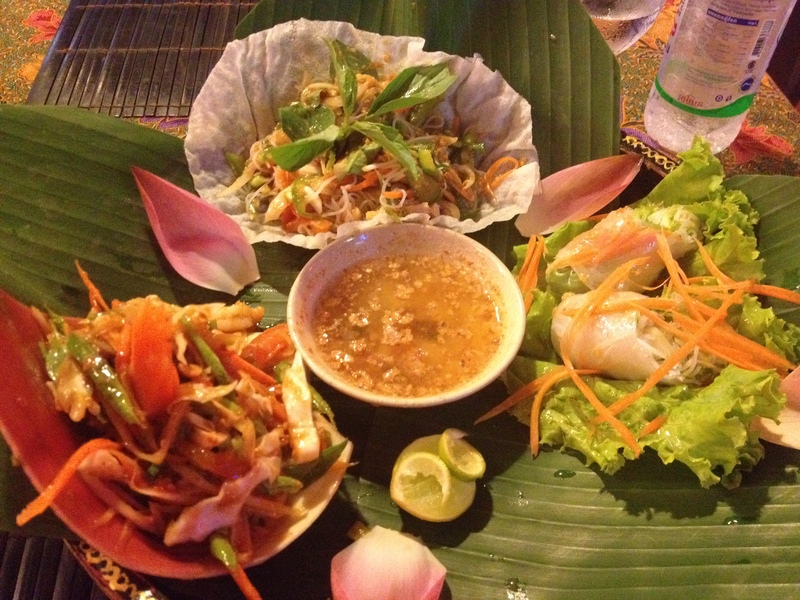 Let’s just clear one thing up though – most Cambodians eat on a diet similar to the above. 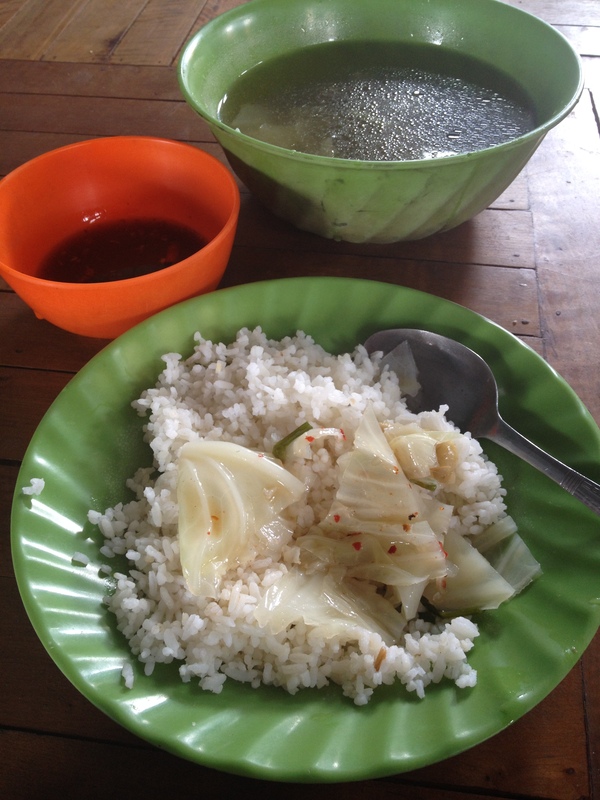 Rice for breakfast, lunch, and dinner, with a side of some fish sauce or chili sauce, and to put over the rice, often a brothy soup that has cabbage or other greens in it, and some little pieces of chicken. They will also catch little fish from nearby ponds and fry those up as well. Simplicity is obviously the name of the game. 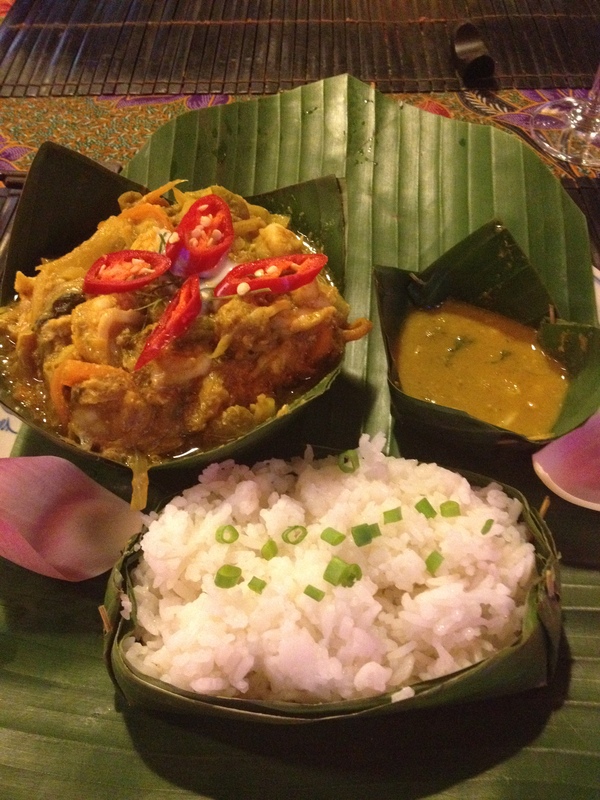 I was lucky enough to be able to try some of Siem Reap’s nicest restaurants and sample a variety of interesting Cambodian cuisine. 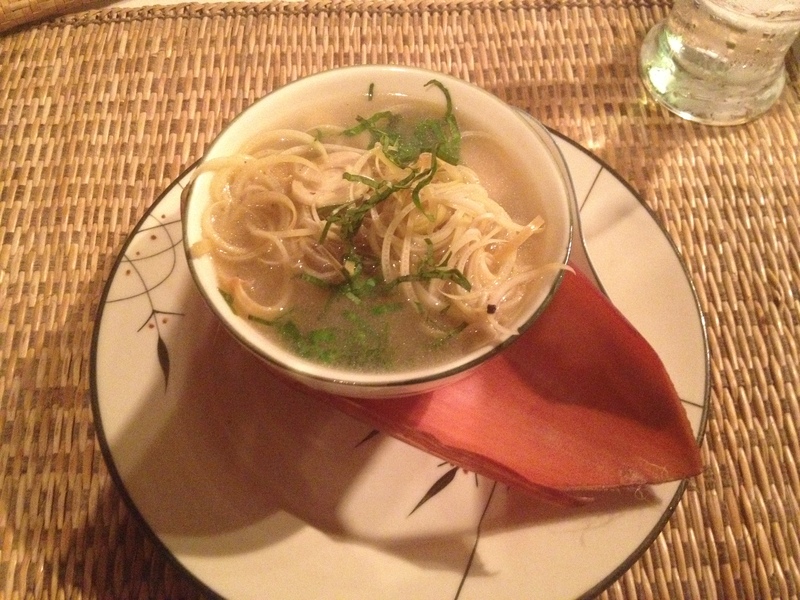 Above is banana flower and chicken soup at the Alliance Cafe. It was incredibly hot and I wasn’t exactly in the mood for soup but this is one of the dishes I enjoyed the most. After sampling banana flowers in Hanoi, I just really like the flavor they add to soups and salads. 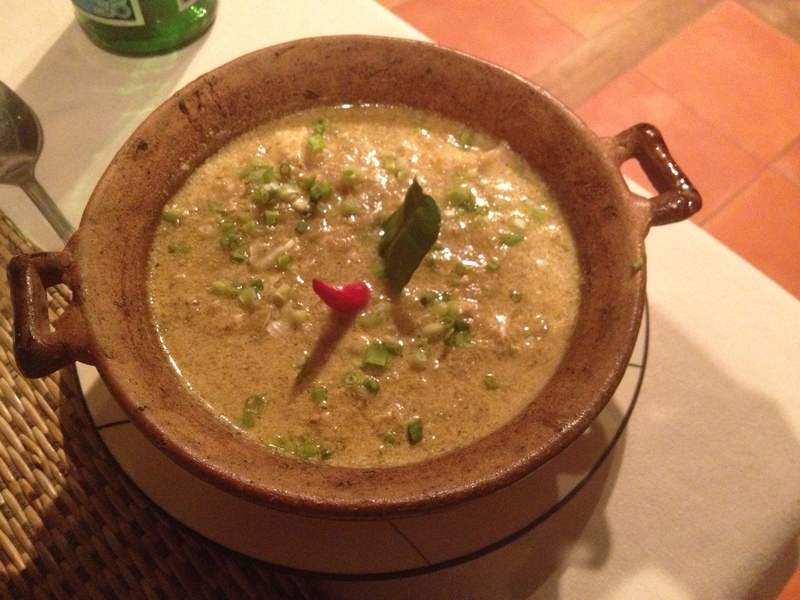 Many Cambodian restaurants offer some variety of curry called amok. This was a fish version which was fairly mild but deliciously flavored nonetheless. It’s not the prettiest thing in the world but I was a fan and I normally don’t like curry – I just really like everything in Cambodia I guess. A lot of these restaurants would offer “degustations” of multiple courses for about $15. Yeah, I’ll take that. Here’s more amok curry – with shrimp this time. I honestly don’t like white rice most of the time but when in Cambodia…it’s just delicious with this curry in particular. One of the nicest restaurants in Siem Reap is Cuisine Wat Damnak, which has degustation menus that change on a weekly basis and uses only fresh local ingredients. It will run you about $30 but for 4-5 courses that’s kind of amazing (although of course astronomically expensive by local Cambodian standards). 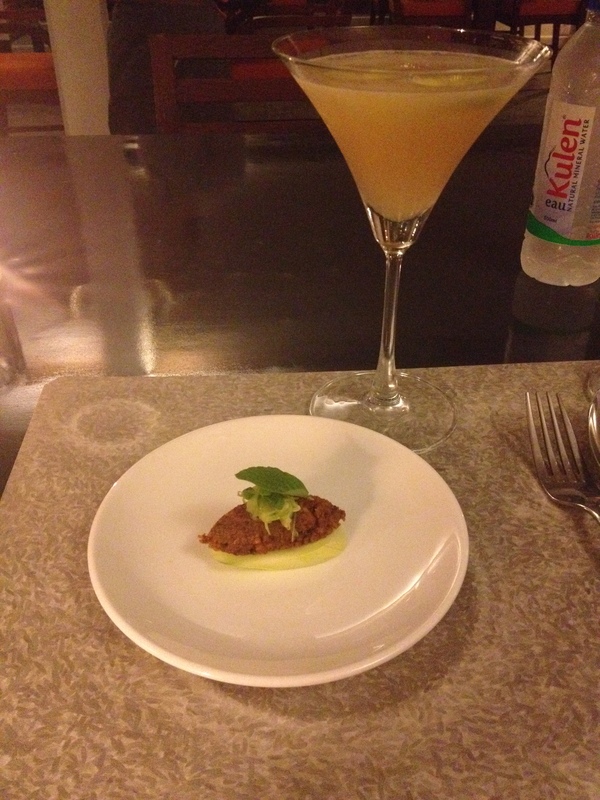 They did a damn good ginger lychee martini along with this amuse bouche of pork over cucumber. Fresh coconut tree heart salad and pounded toasted coconut, served with pan fried snakehead fish. The wedge of lime on the side complemented the flavors perfectly and I just loved the fresh coconut. 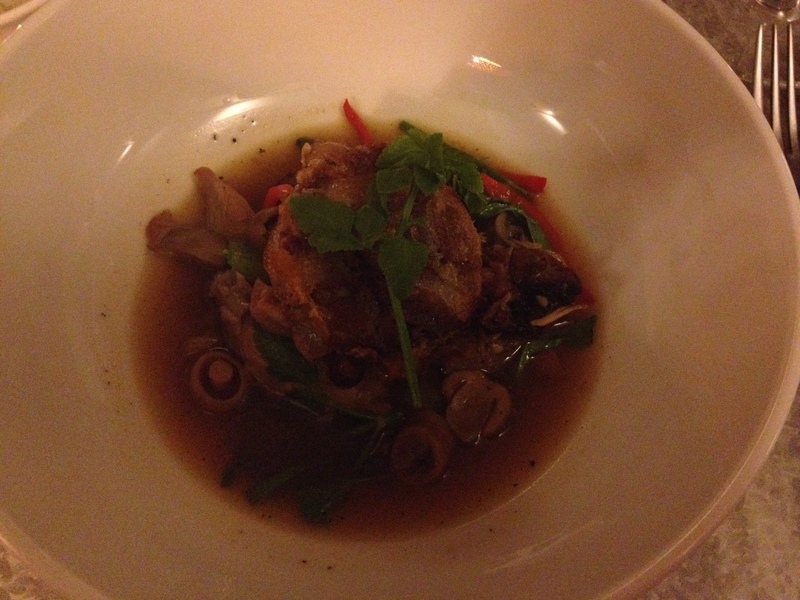 Braised barbeque pork shank with wild mushrooms, loofah, and holy basil. Loofah is an Asian vegetable apparently. I was really just focusing on the amazing flavors in the sauce and I especially loved the mushrooms. 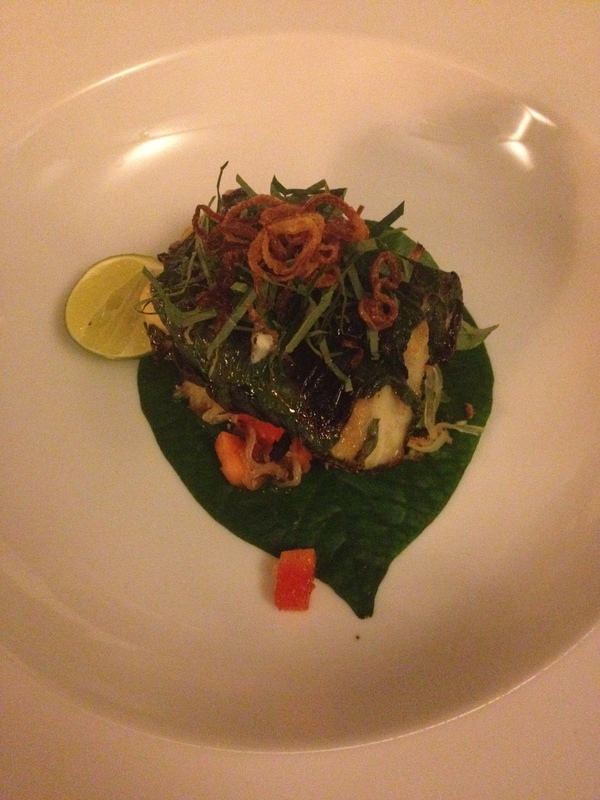 Here’s grilled Sanday fish (local fish) in a wild betel leaf with pickled green and ripe papaya salad. 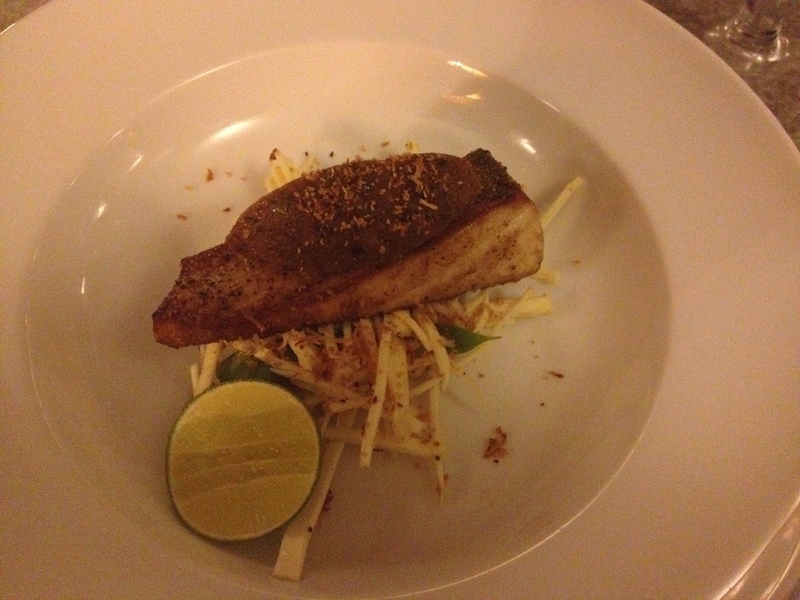 Fish is one of my favorite things and papaya salad is as well, so combined they were just fantastic. It was also delightfully light. Sadly my focus in the photo is off but this had to be documented nonetheless. 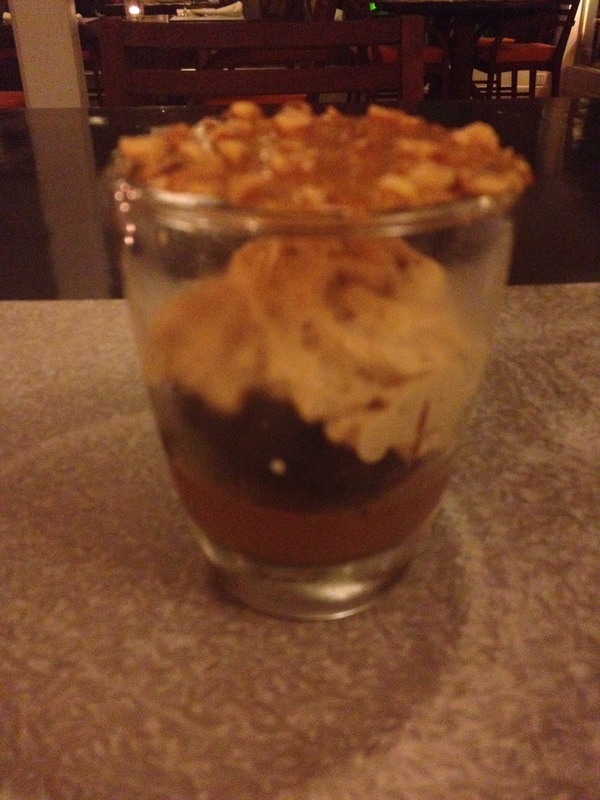 Desserts aren’t very big in Asia so I absolutely relished this one: a dark chocolate pot de creme and steamed chocolate cake with a peanut mousse and peanut nougatine on the top. So refined and delightful and probably the best dessert I had on the entire trip. YUM. There are plenty of additional places where I ate where I was just too hungry or sweaty/tired to document it, but I did want to mention a few places that I’d highly recommend going if you are in Cambodia and want to give back to the community. One of the best ways to do this is through going to restaurants that support locals or help train disadvantaged children. I loved Green Star which supports a fantastic cause, and I was really excited about the concept of Friends International, which has several restaurants across southeast Asia, including in Siem Reap (where I went to Marum) and in Phnom Penh, which I also visited. I appreciated that I was able to support some worthy causes while also eating delicious meals. Cambodia is an incredible place with highly underrated food and while eating there is only one small part of an incredibly immersive experience, it’s definitely worthwhile to seek out some noted establishments and enjoy all that Cambodian cuisine has to offer!